Stromboli's Ristorante was an Italian restaurant at the Disneyland Hotel. Stromboli's had really good food, and I used to eat there on special occasions (like my birthday!). I was saddened when they closed it, along with the Monorail Cafe, when Disney created the new Disneyland Resort. 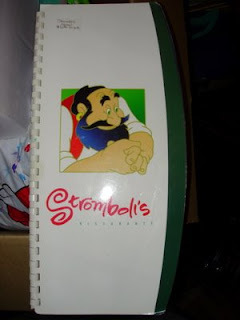 As you can see, the restaurant was named after Stromboli, the evil puppeteer who put Pinocchio in a cage and threatened to chop him into firewood. The restaurant had a Pinocchio theme, and was quite charming. Diners had a nice view of the old marina, which has been replaced by the Neverland Swimming Pool area. I bought this menu at an NFFC Disneyana Convention- the price tag is still on it, as you might be able to see! I would try the NFFC's Disneyana Show and Sale (check out nffc.org). I would also check with FantasiesComeTrue.com.